Kathy Hays displays her eco print creations outside the Wet Room. 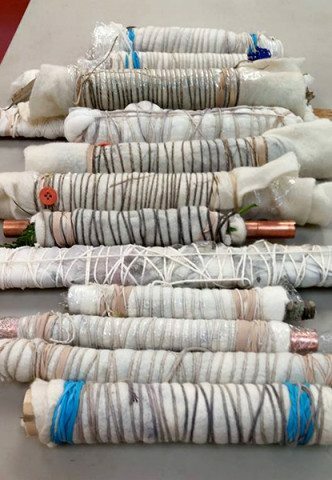 I stopped by the Wet Room to visit Kathy Hays’ recent class “Eco Printing Meets Felt Making” to see what they were creating. 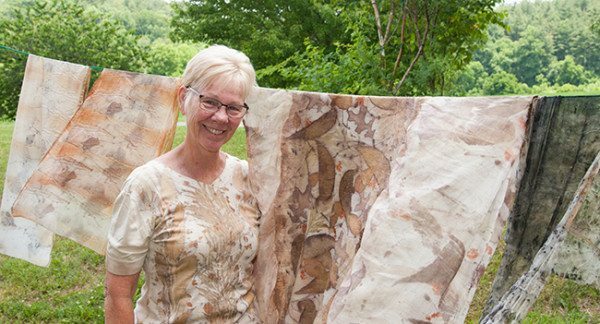 I talked to Kathy about her craft and the joys of eco printing. Enjoy our interview! CP: Tell me about where you’re from, what you do there, and about your craft. KH: I’m from Florida, an unusual area for felt making due to the climate. I began making felt here at the Folk School in 1999. After struggling and trying to figure how to make felt on my own, I was able to come here and after the first day, it was like all my questions were answered! The rest of the week was purely a bonus. CP: How is Nuno Felting different from other felting? KH: Felt making is wool fibers being arranged and then adding soap, water, and agitation. In the case of Nuno Felting, you are merging fibers through another fabric. The term is a little ambiguous. That fabric can be cotton, linen… anything that is thin enough for it to come through. It creates a unique texture when it does that. and bark on the fabric in preparation for the dyeing. 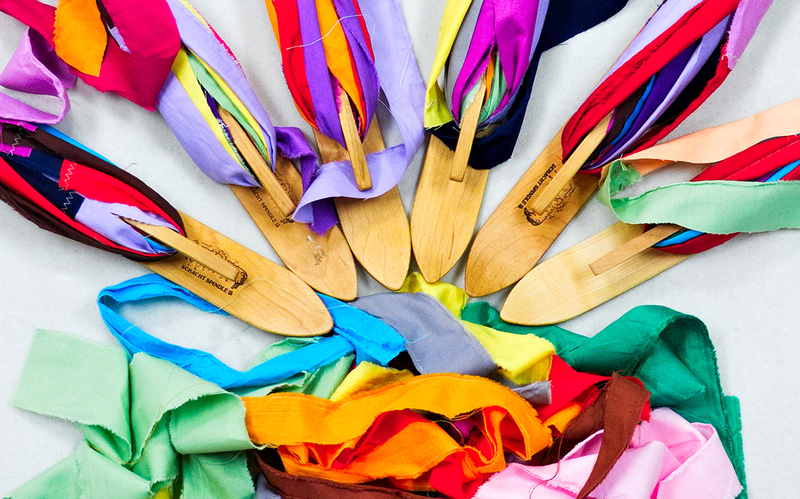 CP: What is eco printing? 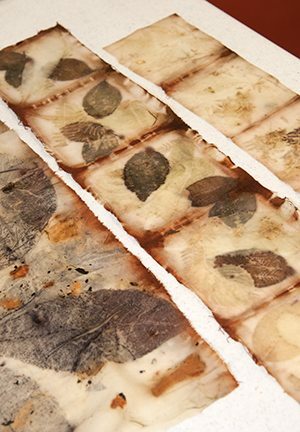 KH: Eco printing is a sustainable print technique using plant matter, whether it be from windfall or found in someone’s garden. We gather plants like leaves, seedpods, barks, etc. and place them on the felt (or other fabrics like silk and wool). The natural objects contact the fabric very closely. Next, we add iron, or some sort of metal, to that solution. A bundle is made, wrapped tightly, and processed for two hours with steam or boiling water. It is a form of “contact printing” because of the essence of contact. CP: What is your favorite thing about eco prints? KH: One of the nicest parts about eco printing is the element of surprise. Every student experiences it. They carefully select plants, roll them up, put them in the cooker and it’s that surprise element when they start opening their bundle. Everybody’s excited and there’s something magical in the unveiling of the print. You don’t expect a dried-up leaf will give you such beauty. You get a giddy and want to do more. It can be quite an exciting process and when you get to share that process with other people, now that’s really what’s nice. You may not get what you expect, but you will love what you get. An exciting moment… unwrapping the bundle! KH: Here, we have a studio space that really is perfect for this because we can walk out the doors and there’s a plethora of herbs, trees, any kind of plant life. We go and gather material instantly from the Folk School ground and can start printing. CP: At the Folk School, artists often walk the line of conceptual art versus functional art. How do you feel about this in relation to your work? Bundles waiting to be unwrapped… what surprises await! KH: I have a sewing and construction background and I have also written two eBooks about making seamless felted garments. I’m drawn to craftsmanship and then taking the design farther after creating a solid foundation, especially with garments. I think there is a great opportunity to take fashion farther with felt making, but that’s more of a contemporary approach. I’ve seen many foreign felt makers whether it be Russian or Scandinavian, especially those in colder climates design really fantastic pieces. 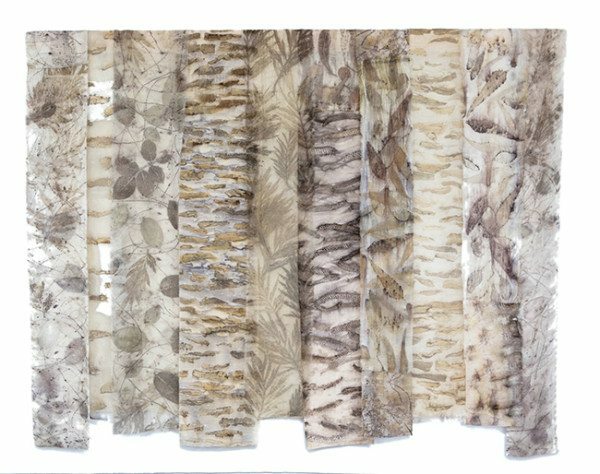 I love textures and surfaces and I see them both felt making and eco printing being very on the edge of contemporary movement. CP: What drew you into felt making from a sewing perspective? KH: There’s a magic with felt making that you don’t always get in using common sewing textiles. I’ve always been amazed at how something so fluffy can be transformed into a workable textile. 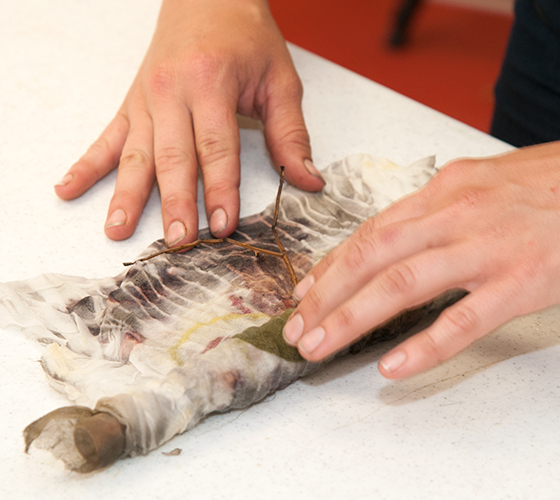 There’s something that happens below your fingers and it’s a very hands-on approach. For me, it’s the magic what happens below my fingers and the change in that transformation that just makes my heart sing. CP: What are your student working on in class this week? KH: They’ve been focusing on flat pieces of felt and then getting good prints on them so they can maybe design wall hangings or use them as smaller pieces to be incorporated into something else. One person made a birdhouse and another made a handbag, but I’m focusing on teaching techniques and basics. I like the Folk School because you have a chance to teach student the fundamentals and then they get to integrate that with their experience and aesthetic. By providing those basics is just the jumping off point. If I can get a student to that point, the point where they really understand this new medium, I know they will take it further. CP: Where do you find inspiration in your design process? KH: Nature itself, of course. My resources in Florida are limited, so I let the material drive my design aspect in my aesthetic. For example, instead printing the leaves, I will take only the stems and print in a graphic manner so it has a very contemporary feeling. KH: I think as an artist you grow, and what was your favorite a year ago, isn’t it your favorite today. I just completed something that’s at the fine arts Center at home and it is a collection or collage of all the different botanical prints that I’ve done. 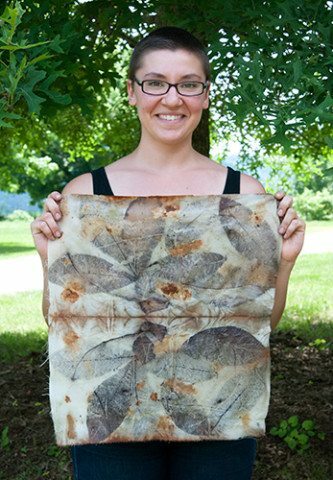 It is printed on very gossamer fabric and backed out by another naturally printed to fabrics so as somebody walks by its like the leaves are moving at all times. That’s probably my favorite right now. KH: Regarding eco print, I’ve told my students: it’s nature, you cannot control it. Rule #1 is whatever you print, nature has given you this print, and you have to love it. 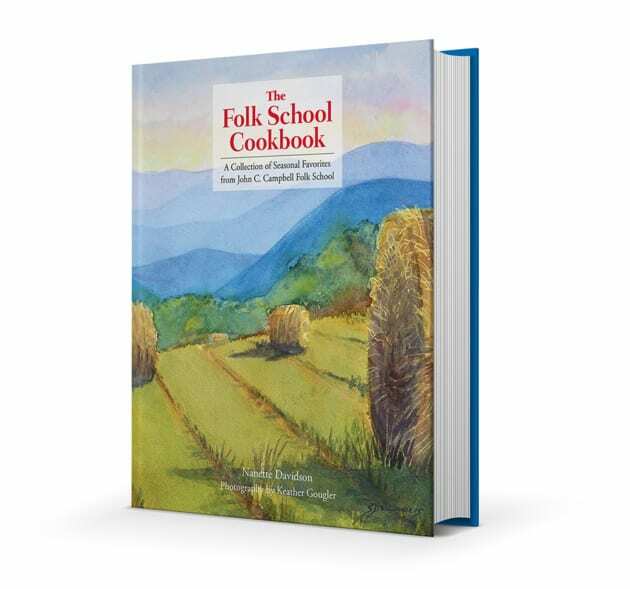 That’s the way I see the Folk School. Everything around here is very pleasing and all you have to do is enjoy each offering from nature. Absolute beauty. Visit Kathy’s website to learn more. I just found your article, and I love it! 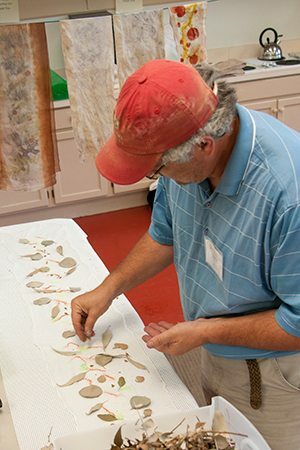 I started eco printing on silk this summer, and I agree with Kathy, you cannot control it, but you have to love it. 🙂 So I love it! I plan to experiment and learn about it more and more, because it’s amazing me how those leaves or flowers give their natural colors to the fabric. Every time just somehow different. Isn’t it magical? great article.. 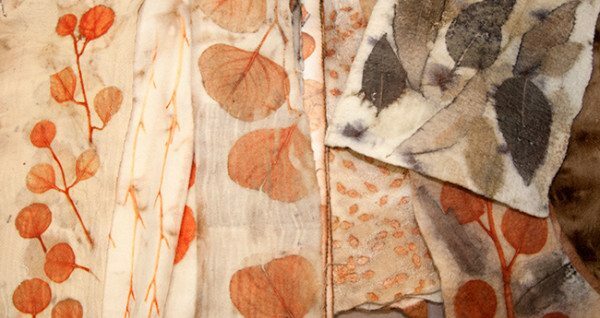 I know Kathy personally and have taken a mini course from her with nuno felting…she is a great teacher…I’d love to attend her workshop at Campbell school.